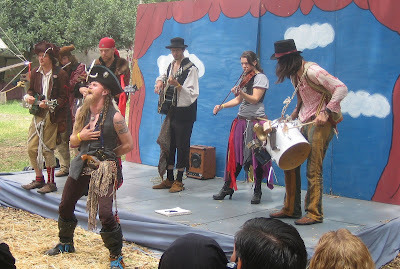 When the hell did pirates come along and co-opt renaissance faires? Aren't they in the wrong century, by like, a lot? This was the first renaissance faire I've been to since well before Lily was born. Back in my day (read: the early to mid '90s), the attendees in costume provided great people watching and musings (just who ARE these people? And what do the insides of their houses look like? ), but now -- I dunno. I still enjoyed the people (freak) watching & musings, but if I want to see grown men & women dressed up like Captain Jack, I thought I just had to go to Disneyland. Reading this over, I sound very anti-pirate. Totally, I'm so not. I just miss the bawdy costumes and vibe of the "real" Renaissance Faire, the one they used to hold up in Glen Helen in San Bernardino, and this year is in Irwindale. The faire we went to on Sunday down in Escondido was a smaller deal by a lot, but the kids, especially Lily, had a good time getting an eyeful of non-suburban fun & weirdness. And by the way, the (literal) band of pirates above? They FELT it, man. Or should I say, these were some hearty damn hearties. My favorite part was when this dude whipped out a fake gun and demanded tips in his big pirate hat. But still -- knights, jousting, jesters, the Virgin Queen -- and pirates? It ain't right, I'm tellin' ya. I'm not sure whether to blame Johnny Depp, Disney, or...Keith Richards. So I've always wanted to do a meme, but sadly nobody has ever tagged me -- I suppose I'd actually require a reader with a blog for that. I know I've been free all along to tag myself with any interesting meme I've stumbled upon in the past, but the fact is that sometimes they seem to require an awful lot of thought and insight and energy that I typically just don't have in the evenings. But this meme I found tonight on the blog of jewelry designer Lisa Leonard seems perfect. Fun, fast, not too hard, and yet revealing, too. I found Lisa's site many months ago and have been so fond of her personalized jewelry. I kept meaning to send Myk a link to her site as a hint for Christmas, but I never got around to it, and could never quite decide which design is my favorite. (Heads up, honey: I want one of these for Mother's Day. I'll let you know which one...maybe the Featured Design for April?) A friend of mine directed her husband there for Christmas, and her necklace turned out just lovely. Normally I'm decidedly not a fan of personalized, monogrammed, mom-specific jewelry, but these are really nice. Besides which, Lisa seems like a very dear and funny and brave woman and mom, and also I have to hate her just a little bit for having my kind of hair: curly, thick, impossible: and yet she's able to wear it cut short and still look cute and perky --- not bloated and old, as I always seem to look with short hair. 3. Living in a neighborhood or city with 200% more charm and culture than my current one. 4. Then again, life with the kids here in the outer 'burbs is still pretty damn good. 3. The summer, with Lily out of school: the park, the pool, friends, and hours to kill. 4. Lily starting 1st grade at the end of August and staying at school until 3:15! Lily (sounding exasperated): What are you trying to say, Tucker??? Tucker: Um, I love you. Lily: Oh. I love you too, Tucker.